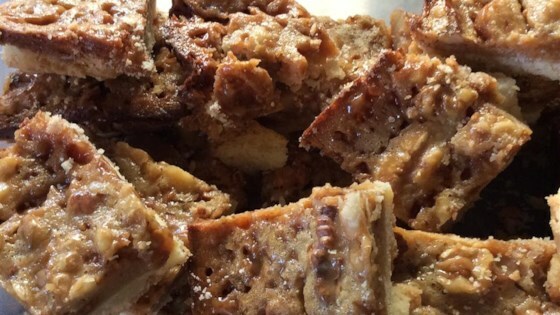 "A sweet, nutty, chewy buttery delight. I've had guests tell me that it's pure gold. This is a variation on a blue ribbon winning recipe. Also great with semisweet chocolate chips sprinkled on top, for chocolate lovers." In a medium bowl, mix together the flour and confectioners' sugar. Rub in the butter until no noticeable lumps remain. Press the flour mixture evenly onto the bottom of the prepared 9x13 inch pan. Bake for 15 minutes in the preheated oven, or until firm. While the crust is baking, mix together the sweetened condensed milk, egg, vanilla, and salt in a medium bowl. Stir in the cashews and toffee bits. When the crust comes out of the oven, spread the nut mixture over it, and return to the oven. Bake for an additional 18 to 23 minutes, or until golden brown. Cool in pan completely before cutting into 1x2 inch bars. These were easy and fabulous. The toffee bits came in an 8 ounce package instead of 6 ounces, so I used 8 ounces and it worked fine. Absolutely delicious and SO easy! Next time I might drizzle dark chocolate over the top! Not sweet enough for me. Everyone else loved them though. Maybe chocolate drizzled on top? Love these bars, but does anyone know how to make the crust hold together better?